Player of the week - Owen Poirer was an absolute BEAST pouring in a game and season-high 23 points including 8-12 from the charity stripe. Shay Gorman (9 points) hit a jumper with 16 seconds left to lift the short-handed Panthers to a thrilling (and rather interesting to say the least) come-from-behind payback 39-38 victory over a Mendon-Upton squad that beat Marlboro by 13 points just two weeks ago. Owen Poirer was an absolute BEAST pouring in a game and season-high 23 points including 8-12 from the charity stripe. Lucky Koganti (4 points), Emanuel Lemes (2) and Tim Walsh (1 FT) rounded out the scoring for the Marlboro. Markus Elpido played excellent defense on MU's point-guard threat down the stretch. The victory moves the Panthers record to 8-2 with 1 game remaining, still clinging to a tie for the #1 seed. The boys improved each game during the Acton Feb vacation tournament and played a good game yesterday. It was a tie game with around 3 mins left in the second half before Leicester scored a few quick baskets and we ended up losing 25-19. I was impressed with the defense and the amount of shots we took. From my calculations we took 72 shots yesterday which I love to see and I expect is a season high by 30+. If we don’t shoot, they won’t go in so great job by the boys on that front. The player of the game was Luciano who played an outstanding game. He ended with 5 pts and was able to get to the line 10 times! He also played excellent on our press and had some great passes, rebounds and a few steals. His overall hustle is really impressive. Marlboro 7th grade boys improved to a 5-5 record by defeating Charlton 50-42. Marlboro was led by Jahki Brookins (17pts) and Mateo Arellanos (15pts). Other contributors were Ryan Dillon (8pts) and Chris Kruger (6 pts). Marlboro still has a change to make the playoffs if they are able to win their final game. The 7th Grade Lady Panthers shocked the previously unbeaten Nashoba team winning by a score of 34 - 31. Marlborough went down 11 - 0 to start the game, but didn't give up. They fought back eventually taking the lead, which they never relinquished despite a frantic push at the end by Nashoba. Marlborough was led in the scoring department by Meghan Deneen and Daisy Dehollan who each scored 9 points. Elizabeth Johnson scored 6 points, Mallory Farrell and Keira Powers each added 4 and Catherine Seay chipped in with 2. Jillian Gowaski, Janelle Zepeda, Maeve Powers and Kyra Duane all pitched in with great defense and tremendous ball movement. Kyra stole the ball under our own basket from an unsuspecting Nashoba player and made a beautiful pass for a Marlborough basket which provided a much needed spark for the comeback. Marlboro has now dropped to 7-2 and has a real fight on their hands to hold on to a #3 playoff seed at this rate. The Panthers have a much-needed 13 day break before their now make-up game with Mendon-Upton again on February 24th. Great Win for the Panthers! It was the teams best defensive effort of the year to e an arn overdue 1st win! It was a good team win with everyone on the team contributing by scoring, rebounding and assists. The top 2 scorers for the Panthers , were Mason Oglesby with 10 points and Andrew Laidley with 9 points. Grady Cormier, Jeilel Alcoba and Kyle Provost had 6 points each. The lady panthers lost a heartbreaker today at Whitcomb by a score of 30 -28 to playoff bound Leominster. It was a tale of two halves for both teams. The score was knotted 7 - 7 at the half. Leominster jumped out to a 12 point lead in the second half only see it evaporate when Meghan Deneen hit a 3 pointer with 5 seconds left. Unfortunately for the Lady Panthers, Leominster played heads up ball and hit a streaking player for a lay up and the win with 1 second left. A real heartbreaker to say the least - but the Lady Panthers showed tremendous character in their battle back in the 2nd half and have nothing to be ashamed of. Marlborough was lead in the scoring department by Daisy Dehollan who scored 8 points and grabbed 8 rebounds. Meghan Deneen added 7 points, Elizabeth Johnson added 6, Mallory Farrell chipped in with 5 and Catherine Seay scored on 2 beautiful drives to the basket. Blackstone-Millville was a superior team in all facets of the game on Sunday, waxing the Panthers 34-16 from jump street. BM's coaching and relentless man-man trapping defense was the difference in the game, completely shutting out two of Marlboro's "Big Three". Jack Lehane (7 points) and Markus Elpido (4 points) were the lone bright spots for the Panthers on the offensive end. A day later, Marlboro is still in search of who was covering Blackstone Millville's #6 in the 2nd half as he registered 12 points on WIDE-OPEN layups. The Panthers are now in a tie for 1st place and will attempt to bounce-back with a practice dedicated to understanding who is covering who on every possession. We're on to Cincinnati, err Mendon-Upton. The 5th Grade boys won a hard fought game against Northbridge 40-34. Our press looked much better and led to some key steals down the stretch. The player of the game yesterday was Owen Ott. He had 7 big rebounds and 2 points on a crucial layup in the second half. An honorable mention goes to Chris Roy who shot 100% (2 for 2) and ended with 4 points and two rebounds. Marlborough lost a tough game on Sunday to Millbury 49-36. After falling behing early in the 1st half by 13 Marlborough fought back to cut the lead to 1 by the help of good defense and aggressive play from Miguel Borges (6pts), Fernando Ridrigues (4pts) and Jahki Brookings (15pts). However, this wasn't enough as Marlborough managed to keep it close for most of the second half until Marlborough needed to foul and then Millbury pulled away. Bella Miele lead the scoring with 14 including 2 of 2 from 3. Emma Reynolds and Kaelyn Deneen added 4 points and Marisol Burgos rounded out the scoring and played great D. The girls have strung together a nice 4 game win streak. The Lady Panthers won a hard fought battle against their counterparts from Littleton on Sunday. Down 14 - 12 at halftime, the Panthers came roaring back in the 2nd half to win 27-20. The Panthers outscored their opponent 15 - 6 in the second half - with everyone contributing on the defensive end. Keira Powers had 4 steals to lead the defensive effort. On the scoring side the Panthers were lead by Meghan Deneen and Daisy Dehollan who each scored 8 points. Elizabeth Johnson added 7 while Mallory Farrell chipped in with 4. Marlboro got off to a great start against a tough Hudson team, but ended up taking a tough loss, 49 - 17. Marlboro was led by Devan Gowaski and Maddy Webster, each with 6 points. We continue to build character. The Marlboro 4th grade boys travel squad improved their record to 7-0 with a 35-26 victory over a much improved Hopedale squad. The Panthers had their most balanced offensive game on the season with 7 of 9 players scoring at least a bucket led by Liam Bennett's double-double of 11 points & 11 rebounds. Evan Tucker and Marcus Elpido each chipped in 4 points while Emanuel Lemes and Jayden Lopez each knocked in a bucket. 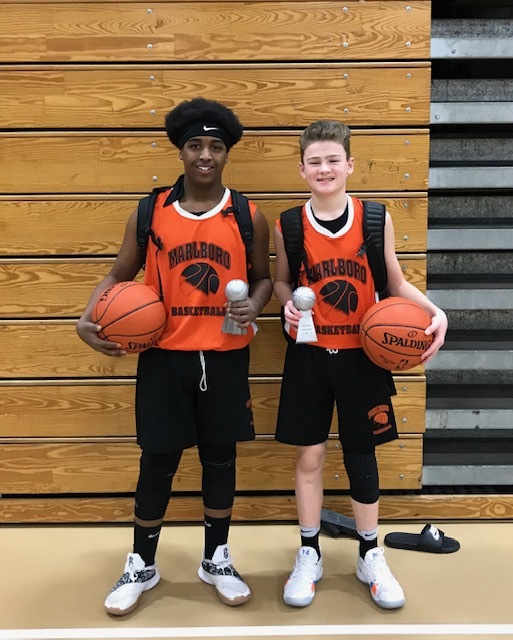 Owen Poirer (7 points) and Jack Lehane (5 points) rounded out Marlboro's scoring on the day. The Panthers play an early-morning Super Bowl Sunday home game vs #3 seed Blackstone-Millville (4-2). We were down 14 at one point and cut it to one a few times with a furious flury. I heard from a few people that it was one of the best games they have seen. He had 7 rebounds (many in the final few minutes) a few blocks and 4 points. The Marlborough Girls 7th grade team lost a tough battle to their counterparts from Wachusett today at Whitcomb. Marlborough played tough throughout and gave their all, but were unable to quench the red hot shooting of Wachusett. Marlborough was paced by Meghan Deneen, Daisy Dehollan and Kiera Powers who scored 10, 8 and 6 points respectively. Elizabeth Johnson (4), Catherine Seay (3) Maeve Powers (2), Mallory Farrell (2) and Janelle Zepeda (1) rounded out the scoring. Marlborough looks to get back on their winning ways next week against Littleton. Player of the week - Maddy Webster had 8 points in her team's first win of the season, with solid rebounding and defensive hustle, along with a clutch basket and free-throw during a late second-half rally to put her team in the lead Sunday versus Dudley. Girls showed their continued improvement avenging a 20 point loss to start the season with a dramatic 38-35 win. Bella Miele was a beast with 30 points the biggest 2 coming off a well executed inbound play with passes from Emma Reynolds (5 points) and KK Moore. KK also had a huge help defense play and rebound to seel the game. Kenley Resendes and Marisol Burgos rounded out the scoring. The win has the girls tied for the final playoff spot. Very proud of the progress the girls have shown this season. The Marlboro Grade 8 Girls team played their best game of the year, defeating a worthy Dudley team by a score of 32 - 31. Maddy Webster and Jess Cash led all Marlboro scorers with 8 points each, with all players contributing key efforts throughout the game, having held their opponent scoreless the first 6 minutes, and reclaiming the lead towards the end of the game. Woo-hoo!! Player of the week - Miller Tucker – 5th Grade Boys - scored 16 points in their win. 4th grade boys withstood a furious Sutton (5-1) 2nd-half rally and moved into sole possession of 1st place with a 34-26 victory over the previously unbeaten Sammies. The Panthers (6-0) blew a 23-7 2nd half lead with a variety of sloppy turnovers as Sutton whittled the lead down to 1 point with 4:30 to play. After a timeout, Marlboro upped their defensive pressure & attacked Sutton's press to right the ship and seal the victory. Liam Bennett continued to be a monster down low, hauling in 20 rebounds along with 7 points. The Panthers displayed their most balanced attack of the year led by Jack Lehane (9 points, 6 steals), Owen Poirer (8 points, 6 rebounds, 4 steals) and Shay Gorman's 6 points. Danny Mosca (5 rebounds) and Jayden Lopez (4 steals) each also registered key buckets. Great game by everyone today and a much deserved win. We had 8 of 10 players score which was very impressive. The player of the game was Miller who had 16 pts and got us started off from the start with a huge 3 pt bomb. We needed someone to step up today and Miller did a great job on offense as well as very tough defense. This was the highest points by anyone on our team this season. Everyone played great and an honorable mention goes to Sal with 8 points (and a pair of new shoes - nice motivation Renee) :) and Jonathan who had his best game of the year with some key rebounds and at least 4 blocks. We are back in the playoff hunt so great job to the entire team. The Mallboro boys seventh grade team fell behind early to Douglas who is five and I’ll coming into the game. Marboro trailed by 10 at halftime but battled back behind the scoring of Jahki Brookings (14 pts), Mateo Arellano (10pts) and Ryan Dillon (8 pts) they were able to cut the lead to 5. Other contributors were Miguel Borges who sank a big 3-pointer and David Rosengard who dominated the boards. Unfortunately the comeback fell short and although we battled Douglas evenly in the 2nd half we lost by 10. The Marlborough Girls lost on Sunday to their counterparts from Acton by a score of 43 - 29. Despite the score, Marlborough competed hard for the whole 30 minutes. Marlborough was lead by Meghan Deneen who scored 14 points followed by Daisy Dehollan who pumped in 6. Elizabeth Johnson scored 4 points and Janelle Zepeda and Maeve Powers each added a basket. Congratulations to the following winners of the 2019 Calendar Raffle.